The following interview is a guest post from metalsnews.com. Epstein Research does not own any stocks mentioned in the interview, and has no prior or existing relationship with White Rock Minerals. 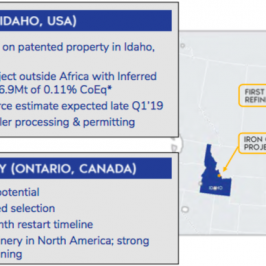 White Rock Minerals (ASX: WRM) is an Australian minerals exploration and development company, with projects located in central Alaska and New South Wales. The 100% owned zinc-silver-lead-gold Red Mountain VMS project in central Alaska has a maiden JORC 2012 Resource of 9Mt grading 13% ZnEq. 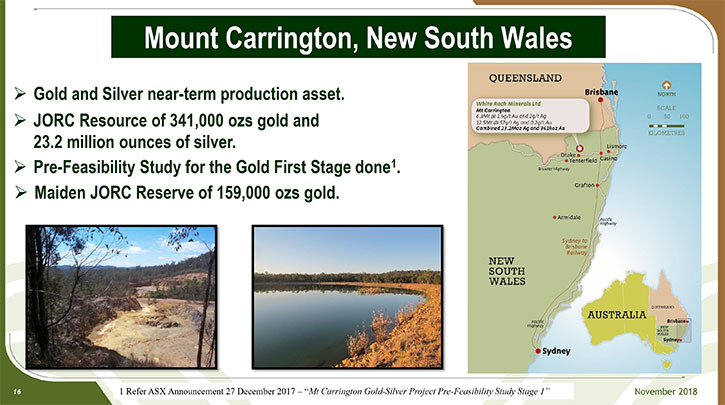 The 100% owned Mt Carrington gold-silver project in New South Wales, Australia, has a JORC Resource of over 300,000 ounces of gold and 23 million ounces of silver. We learned from Matthew Gill, Managing Director and CEO of White Rock Minerals, that the next step is to commence the environmental approval process at Mt Carrington that will take about 12 to 18 months. We also learned from Mr. Gill, that their Alaska project attracted a billion dollar company, called Sandfire Resources, who became their largest shareholder this year with 13% of White Rock and an option to earn 51% through a joint venture agreement. Sandfire will be required to spend a minimum of A$20 million over four years. Dr. Allen Alper:This is Dr. Allen Alper, Editor-in-Chief of Metals News, interviewing Matthew Gill, who is the managing director and CEO of White Rock Minerals, Ltd. Could you give our readers/investors an overview of your Company? Matthew Gill:Certainly Al. White Rock Minerals is an ASX listed, small minerals exploration and development company. We have a market capitalization in Australian dollars of around 10 million. 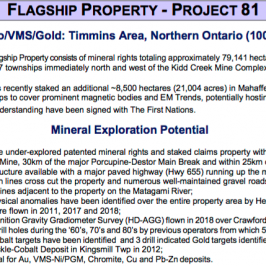 We have about 2 million dollars in the bank and we have two projects, an advanced gold and silver project in Northern New South Wales, here in Australia and we also have a pretty exciting zinc and precious metals (silver and gold) VMS project in central Alaska. Dr. Allen Alper:That sounds great. Could you tell our readers/investors a little bit more about both projects and why they are significant? 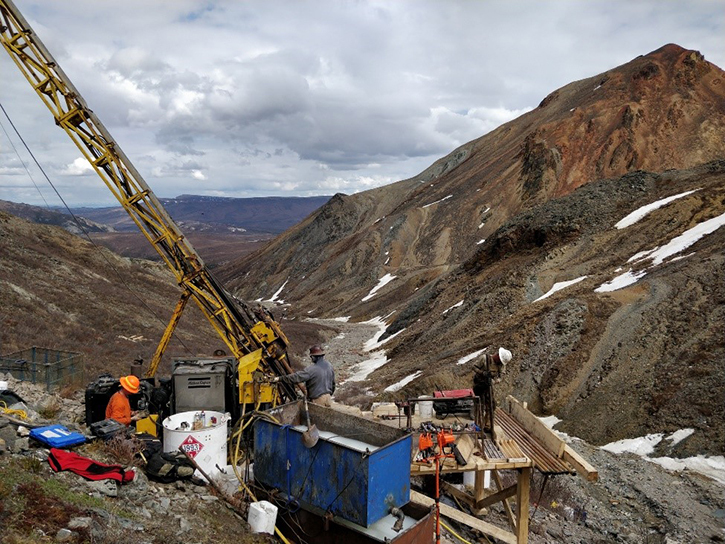 Matthew Gill:The more exciting project and our focus for 2018 was our zinc and precious metals VMS project in Alaska, called Red Mountain, to the degree that we raised funds earlier this year and conducted our very first exploration program on the ground there. That saw a diamond drill do a bit over 4,000 meters of drilling, and saw the first application of on-ground geophysics. It also saw up to three geochemical reconnaissance crews mapping and sampling our extensive land package. Late last year, we released a very positive feasibility study on the gold first portion of our other project, in Northern New South Wales, our Mount Carrington gold and silver project. 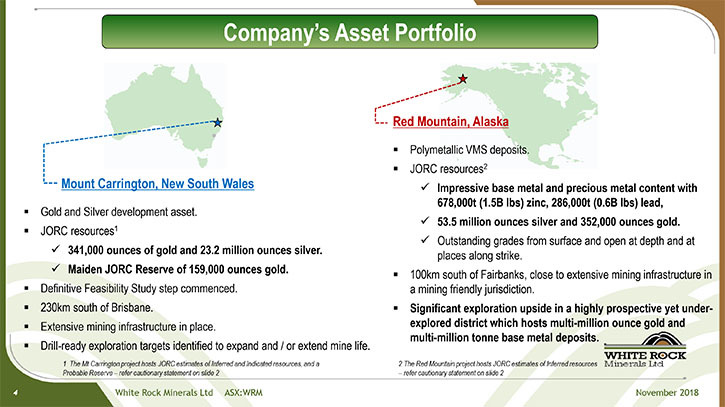 That project has a JORC resource for the gold and silver and a reserve for the gold half. And there are still about 23 million ounces of silver that we’d like to bring into that JORC reserve and mine plan. It’s quite well advanced. Its next step is the environmental approval process. Dr. Allen Alper:That sounds great. Could you tell our readers/investors a bit more about each project? 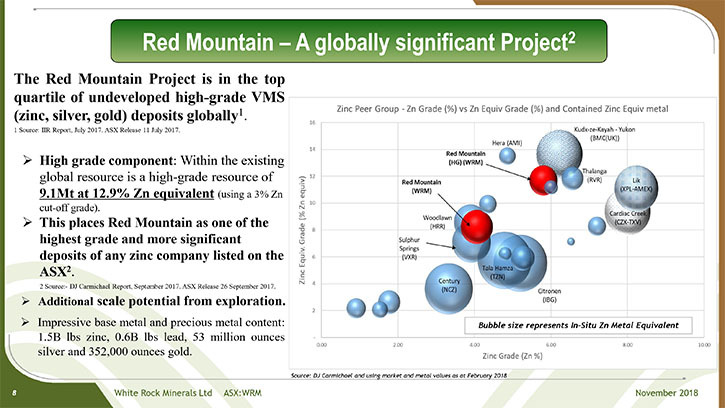 Matthew Gill: On the Alaskan project, during the year we were diamond drilling and getting results of four and five meters wide intersections, running over 40% zinc equivalent, so significant intersections, showing significant amounts of zinc, with silver, even gold as well as lead, with some drill hole results returning in excess of 17% zinc, 6% lead, 1,000 g/t silver, 6 g/t gold and 1.5% copper. Those drilling results were great. 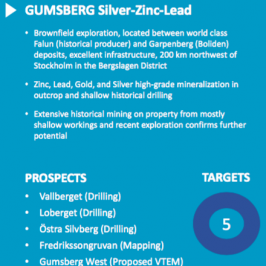 We made a green fields discovery about five kilometers from the two known deposits that had outcropping zinc sulfides on the surface and which can be traced for over 500 meters on surface and is open at depth. We put only two holes into that deposit and got one to two meters wide of over 20% zinc. So from a drilling results and discovery point of view, we are very happy with those results, along with the broader stream sediment sampling work that we did. Dr. Allen Alper:That’s excellent. 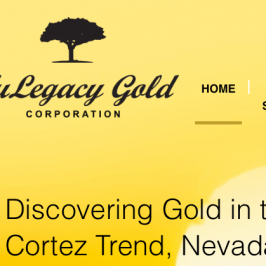 Tell us a little bit more about the gold and silver Mount Carrington project. Matthew Gill:Technically Mt Carrington is well understood with the feasibility study now done. It’s informed by 100,000 meters of drilling, with good geological modelling, mine design, three phases of metallurgical test work, and a process flowsheet that has been designed and costed. You literally walk onto the gold orebody, the two gold pits are pre-stripped. The project’s next step is the environmental approval process. White Rock’s balance sheet doesn’t allow us to progress both projects as we would wish, in an ideal world. For this year, we focused on our Alaskan asset, whilst we ready ourselves to commence the formal approval process at Mt. Carrington, but we’ve yet to commence that approval process, which is about 12 to 18 months of work. We do though continue to maintain the site and continue to gather the baseline environmental data necessary for this approvals process. Dr. Allen Alper:From what I understand, you have strong potential to increase the resources at those projects, is that correct? Matthew Gill:Yes. 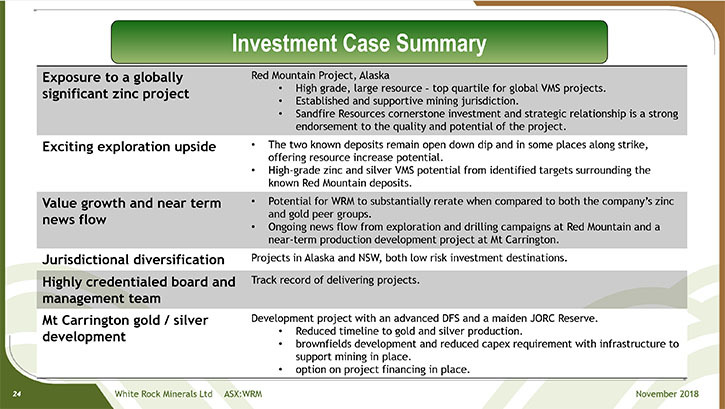 The work that we did in Alaska attracted the attention of an ASX listed company, called Sandfire Resources. Sandfire is a billion dollar company. They are very successful in exploring, developing and currently mining a VMS project in Western Australia. They also have an advanced project in Montana. They liked what they saw we were doing. And they are now our largest shareholder, with 13% of White Rock, with an option to enter into a joint venture agreement. The first stage would see them spend a minimum of 20 million dollars, Australian, over four years before they would earn 51%. So for us, that’s a fantastic endorsement of what we believe is the quality of the project. This is another company sharing that view. They did their own due diligence and have been successful previously. They have put some of their money into supporting White Rock to advance our Alaskan asset. They too believe there is strong potential to make further discoveries and increase the current resource base. Given our small market cap, having someone else’s balance sheet working with us to progress the Alaskan asset should be a great outcome for our shareholders. Dr. Allen Alper:That’s excellent. That shows that they have great confidence in what you’re doing. I think the Red Mountain project has excellent potential. So that’s great. Could you refresh our readers/investors’ memories on your background, your Board and your Team and introduce your Company to our many new readers/investors? Matthew Gill:Certainly. The White Rock Board is a bit unusual. There are five of us on the Board. Four of us are mining engineers. We’ve all had over 30 years of experience individually. Also that technical mining engineering expertise is what starts your career. But we do bring different dimensions, skills and experiences to the board. My expertise or experience is probably more in the development, construction and operation of mines. The Mount Carrington project in New South Wales was the reason I joined White Rock. 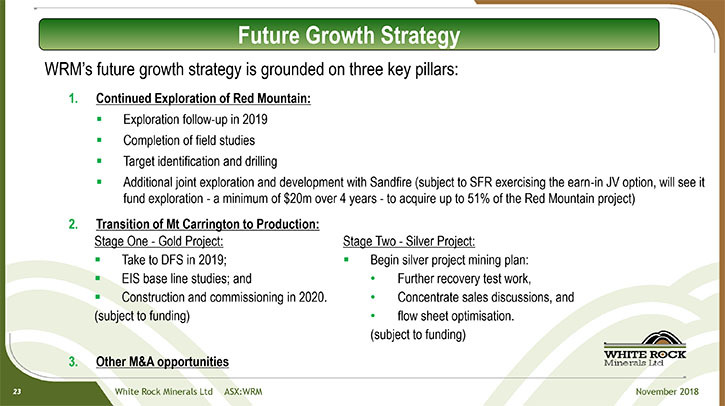 However, being able to advance Red Mountain, working closely with my very experienced exploration manager and develop that, from an exploration geology and mine engineering point of view, is also quite important. The other individuals on our Board include the ex-managing director of Newcrest, which is the world’s third largest gold company, meaning that Ian Smith brings a lot of that broad, diverse, global experience to our Board. 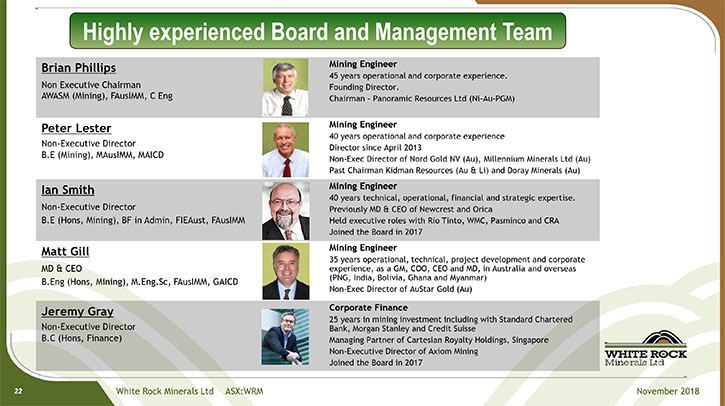 We have two other gentlemen, both are chairmen of other ASX listed companies, in their own right, and have deep corporate, M&A and Project Development experiences. Our fifth member is a finance, metals analyst, capital markets individual. So I think the five of us all bring different components and perspectives to White Rock as we try to grow our business and fundamentally try to extract some of the value that we think sits in our two projects and to get that value reflected for the benefit of our shareholders. Dr. Allen Alper:You’re fortunate to have such a strong, highly experienced and successful Board and Management Team. That’s really great. Could you tell us a little bit about your corporate and share structure? Matthew Gill:Yes. We are a fairly typical Australian company and I do understand that for many in North America it’s a bit of an oddity, we have about 1.6 billion shares on issue, with a share price around half a cent, and so those two metrics are often quite perplexing for people in North America, but it is the way it is for a lot of companies in Australia. We have a market capitalization, as a result, of around A$10 million. And our share structure, our top six shareholders, is quite informative. 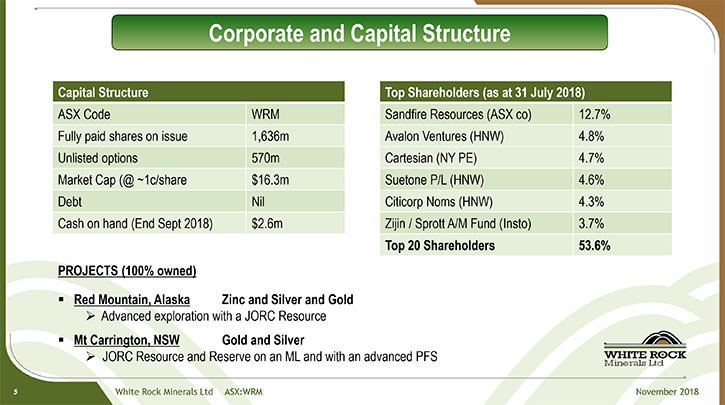 Our major shareholder is Sandfire Resources, the ASX listed company I mentioned, with a bit under 13% of White Rock. And then we have five shareholders that all sit around four to five percent. Three of those five are made up of high-net-worth individuals. One of the other five is a two billion dollar private equity group out of New York. So there is a strong link with North America, both in our share register, but also with our Alaskan asset. The fifth largest shareholder is a large Hong Kong fund, called Gold Mountain Asset Management. That’s actually made up of Zijin, one of China’s largest mining companies, and Sprott out of Toronto. So again, we do have quite a diverse spread, including Australia, Singapore, Hong Kong and North American shareholders. It’s a bit like our board. Good to have that spread and diversity! Dr. Allen Alper:Well that’s excellent. That shows you have strong support by very knowledgeable investors and companies. So that’s excellent. 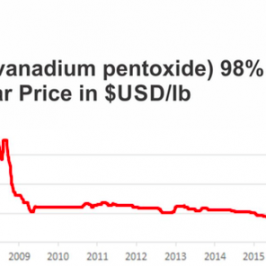 Dr. Allen Alper:What are the primary reasons our high-net-worth readers/investors should consider investing in White Rock Minerals? Matthew Gill: That’s a very good question. When you look at the two assets that White Rock has, and you look at the underlying value that sits with our gold and silver project in New South Wales and also our zinc and precious metals project in Alaska and you compare that to other projects and other companies. There’s a lot of independent research on our website that your readers/investors can go to, there is a big disconnect between our market capitalization and the underlying asset value. I would suggest at some point there will be a re-rating, when markets improve and or the markets wake up to this fact. I think that presents a great opportunity for an investor. Our two assets are in commodities that you would always need. 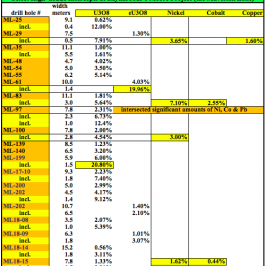 Gold is a good commodity to be invested in, in any portfolio. It’s not just a metal, it’s a currency, it’s a hedge against inflation and often an investment to go to in times of risk and uncertainty. Silver I think has a strong potential to follow gold. And zinc is one of those base metals that you need along with copper. Our third investment proposition point is our jurisdiction spread. We’re in two first world jurisdictions that follow the rule of law. Both speak English. I think combining those three points: our undervalued position compared to our assets, the fact that we’re in commodities that I think are and should always be in demand and in two jurisdictions where sovereign risk is a lot less than in many other parts of the world. I think these are three compelling reasons for an investor to consider looking at White Rock. 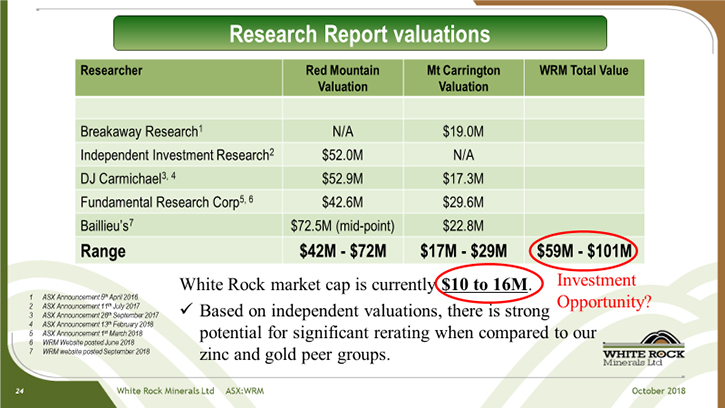 Dr. Allen Alper:Well those are very strong reasons to consider investing in White Rock Minerals. You have an excellent team and excellent properties in excellent areas and great support. All that is very, very good. Matthew Gill:No, I think your questions, Al, have gone right to the core of what White Rock is and what we’re trying to achieve. I also trust I have presented a good investment proposition to your readers/investors. I guess the frustration is exactly what you say, the disconnect between our experienced Board and that value, our assets, and how we’re under-valued in the market. But the market is the market and I guess one of the reasons for me talking to you is to try to get the White Rock story out there so that others can see what we see, a great investment value proposition, and can literally buy on market and join the ride that is the White Rock story. Dr. Allen Alper:Well that sounds excellent. We’ll publish your press releases as they come out so our readers/investors can follow your progress.